Being of marked `Ebenezer Scrooge tendencies`, a couple of months ago I potted up a hart`s-tongue fern from the garden to save me buying a house plant. It seemed to function quite well in its new role but, recently, I noticed that its leaves were becoming slightly discoloured and yellowy. I thought that it might be due to some sort of nutrient deficiency but the reverse (underside) of the fronds `gave the game away` - it was heavily infested by the micro-moth Psychoides filicivora. I`d noticed a few adults of this species on the plant and on the adjacent window in the spring, when I`d first brought the plant indoors, but obviously they have since and laid eggs on my indoor fern. Here - free from predators - they are doing well (too well!) and I`d better take the plant outdoors or Psychoides filicivora may become a troublesome house moth here! Above: the plant in situ indoors. 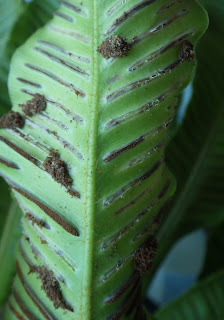 Above: the underside of a frond showing the eaten linear spore-producing sporangia (the pale ones) and the uneaten darker ones. Also visible are the clumped masses of sporangia in which the larvae have gathered and in which they hide. Carefully open these masses to see the larvae. Search your local hart`s-tongue ferns, but be aware of the related P. verhuella. You will need to check the larva`s head - one species is very dark brown (verhuella), the other (filicivora) a much lighter brown. Just `google` the species` names on `UK Moths`for good photos.